The Department of Basic Education Social Cohesion and Equity in Education Directorate, in collaboration with Save the Children South Africa, UNICEF (the funder), and MIET AFRICA (which provided technical support), implemented the Prevent Violence in Schools project in all nine provinces in South Africa. The project aligned with the safety and protection priority area of CSTL. The aim was to build the capacity of education district officials in all 84 education districts (six officials per district) to enable and support learners to take action to prevent violence in their own schools. 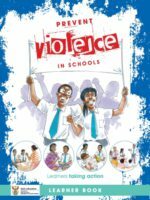 They did this by facilitating learner workshops and mentoring learners in the development and implementation of school-level action plans on the prevention of violence in schools, with a particular focus on gender-based violence. For the project, MIET AFRICA developed high quality training materials (Facilitator and Mentor Guides and a Learner Guide) that lend themselves to being customized to country-specific contexts. Prevent Violence in Schools was funded by the Save the Children, South Africa.